This blog post is part of a series that discusses how to get optimal performance from PeopleSoft nVision reporting as used in General Ledger. If you are on a conventional non-engineered Oracle system, then it is not going to be viable to full scan the ledger tables for every query. You are going to have to use indexes to find your data. Every customer's nVision reports are unique to that customer and the nature of their business. Different customers will analyse their data by different combinations of attributes. Indexes will be needed to match those analysis criteria. A survey of the nVision reports and the SQL they produce will reveal the various sets of columns by which ledger data is queried. The heaviest SQL statements can be identified from Active Session History (ASH) or the Automatic Workload Repository (AWR) (or Statspack if the Diagnostics pack is not licenced). As an example, let's take the following two statements as examples, and consider the indexes that would be needed to support them. nVision queries will always contain single value predicates on LEDGER and FISCAL_YEAR. You may see some queries on a single ACCOUNTING_PERIOD, as in the query above, usually the current period. Otherwise, they might be on a range of ACCOUNTING_PERIODs, usually the year to date as in the example below. Then there will predicates on the other analysis columns, in this case, DEPTID, ACCOUNT, CHARTFIELD1, CHARTFIELD3. You may see criteria on CURRENCY_CD, however, this may not be very selective. Generally, most of the queries will be on the base currency, and most of the data will be in the base currency. Sometimes you may see a criterion on STATISTICS_CODE=' '. Normally, only a very few ledger rows have statistics code, so there is no benefit in adding STATISTICS_ CODE to any index. Generally, single value predicate columns should be placed at the front of the index, followed by the other analysis criteria. However, I would not attempt to overload the index with additional non-selective columns because unless you index all the referenced columns, including the amount columns, you will not be able to satisfy the query from the index only, and you will still have to visit the table. In this case, the above query is part of a fiscal year-to-date report, returning the same period in a previous fiscal year. The system is currently in period 11, so this report is looking at accounting periods 1 to 11. ACCOUNTING_PERIOD is a much less selective criterion in this case. If partitioning option were not available, I might be tempted to demote ACCOUNTING_PERIOD to further down the list of indexed columns if the criterion on the next column is more selective. This query uses 5 trees. A cartesian join of all 5 is likely to produce a product so large that it will not be effective to do index lookups for each member of the product. The columns with the most selective criteria should be earlier in the index. It might not even be worth including columns with non-selective criteria in the index. So you might build an index on the following columns: LEDGER, FISCAL_YEAR, BUSINESS_UNIT, ACCOUNT, CHARTFIELD1, CHARTFIELD2, CURRENCY_CD, ACCOUNTING_PERIOD. It is easy to see how you might build up a large number of indexes on the ledger and summary ledger tables. You might have pairs of indexes, one for single accounting periods and perhaps another similar one for year-to-date for each set of analysis criteria. However, as you add indexes the overhead of index maintenance experienced by any processes that post to the ledger, or by the summary ledger build process will increase. There is a balance to be struck. You will have to build as many indexes with as many columns as are necessary, but as few as possible. If you partition the tables on FISCAL_YEAR and ACCOUNTING_PERIOD and locally partition the indexes, you will only need one of the indexes. Index leaf block dictionary compression can significantly reduce the size of the index. Any increase in the CPU overhead of using and maintaining the index will be more than offset by the reduction in I/O overhead. The optimal prefix length can be calculated using the command ANALYZE INDEX … VALIDATE STRUCTURE. This feature does not require the Advanced Compression licence. 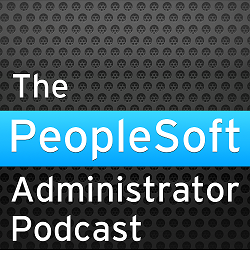 Do you know of an automated solution in PeopleSoft to populate the Tree Selector tables? Think of the tree selector tables as working storage tables for nVision (and the IN TREE operator in PS/Query). They are populated on demand at runtime by nVision. Even if you only ever used static selectors, they would be reextracted as trees change. Although I could imagine a process to build the static selectors in advance and gather optimizer statistics, that is not the challenge. Statistics on static selectors can be maintained with a trigger (see nVision Performance Tuning: 10. Maintaining Statistics on Non-Partitioned Tree Selector Tables).